If Buenos Aires’ founding fathers spared nothing in building the new world’s most beautiful metropolis, neither did their progeny stint in building its most beautiful necropolis. 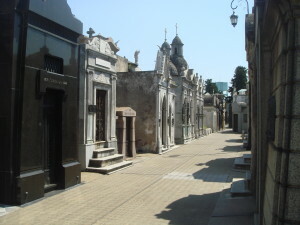 Cementario de la Recoleta, Buenos Aires first public cemetery, was the brainchild of Governor Martin Rodriguez and his minister Bernardino Rivadavia. It was opened on November 17, 1822 and the first person interred there was Juan Benito, a freed slave. Since then it has been the city’s preferred and most prestigious resting place. Historically it’s fascinating – all the greatest and richest of Argentina rest in peace at Recoleta. Artistically, it’s amazing – some of the most elaborate and ostentatious mausoleums in the world are here at Recoleta. Every day thousands of people – tourists, as well as locals paying their respects to deceased relatives pass through the Doric portico at Recoleta’s entrance. Only the elite, however, those with great fortunes and even greater names, find their final resting places here. The most visited grave is that of Evita, Argentina’s most famous female, who lies with the rest of her Duarte family. It’s an interesting and restful day (or two), walking the peaceful, pristine and shady calle of Recoleta.